The following guidelines were prepared by the Committee on the Liturgy and presented to the National Conference of Catholic Bishops for discussion at the June 1994 Special Assembly on Thursday, June 16, 1994. The suggested guidelines have been slightly revised according to the third edition of the General Instruction of the Roman Missal. They may be used as a basis for developing diocesan guidelines. Although institution into the ministry of acolyte is reserved to lay men, the diocesan bishop may permit the liturgical functions of the instituted acolyte to be carried out by altar servers, men and women, boys and girls. Such persons may carry out all the functions listed in no. 100 (with the exception of the distribution of Holy Communion) and nos. 187 - 190 and no. 193 of the General Instruction of the Roman Missal. The determination that women and girls may function as servers in the liturgy should be made by the bishop on the diocesan level so that there might be a uniform diocesan policy. No distinction should be made between the functions carried out in the sanctuary by men and boys and those carried out by women and girls. 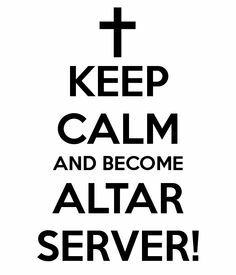 The term "altar boys" should be replaced by "servers". The term "server" should be used for those who carry out the functions of the instituted acolyte. Servers should be mature enough to understand their responsibilities and to carry them out well and with appropriate reverence. They should have already received holy communion for the first time and normally receive the eucharist whenever they participate in the liturgy. Servers should receive proper formation before they begin to function. The formation should include instruction on the Mass and its parts and their meaning, the various objects used in the liturgy (their names and use), and the various functions of the server during the Mass and other liturgical celebrations. Servers should also receive appropriate guidance on maintaining proper decorum and attire when serving Mass and other functions. Since the role of server is integral to the normal celebration of the Mass, at least one server should assist the priest. On Sundays and other more important occasions, two or more servers should be employed to carry out the various functions normally entrusted to these ministers. Acolytes, altar servers, readers, and other lay ministers may wear the alb or other suitable vesture or other appropriate or dignified clothing. (General Instruction of the Roman Missal, no.339) All servers should wear the same liturgical vesture. Servers carry the cross, the processional candles, hold the book for the priest celebrant when he is not at the altar, carry the incense and censer, present the bread, wine, and water to the priest during the preparation of the gifts or assist him when he receives the gifts from the people, wash the hands of the priest, assist the priest celebrant and deacon as necessary. Servers respond to the prayers and dialogues of the priest along with the congregation. They also join in singing the hymns and other chants of the liturgy. Servers should be seated in a place from which they can easily assist the priest celebrant and deacon. The place next to the priest is normally reserved for the deacon. Servers may not distribute holy communion unless they have been mandated for this function by the bishop.